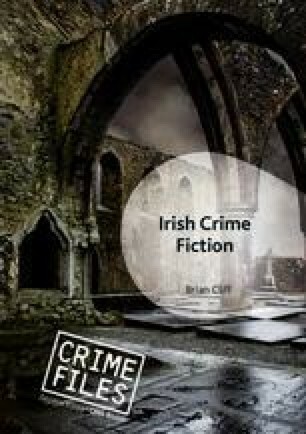 This chapter surveys the history and reception of Irish crime fiction, and connects that survey to existing critical discussions of other Irish genres. It considers the factors that have contributed to Irish crime fiction’s recent and rapid growth in production and popularity. In doing so, the chapter discusses some distinguishing features of Irish crime fiction, including Irish society’s relationship to the police, and the impact of the island’s small scale on the varieties of crime depicted. The chapter also establishes significant patterns in the genre, particularly the role of civic corruption (most often related to land and the property market), supernatural narratives, and the prominence of empathy as a theme. ———. ‘Raising hell in Arizona with a gripping thriller.’ Review of Here and Gone, by Stuart Neville (pseud. Haylen Beck). Irish Times, 29 July 2017. https://www.irishtimes.com/culture/books/here-and-gone-review-raising-hell-in-arizona-with-a-gripping-thriller-1.3164145 (accessed 29 July 2017). Fox, Andrew. ‘Tiger, Tiger: The Hunt for the Great Irish Novel.’ The Daily Beast, 2 February 2014. http://www.thedailybeast.com/articles/2014/02/28/tiger-tiger-the-hunt-for-the-great-irish-novel.html (accessed 3 June 2014). ‘Golden Age of Irish Crime Fiction Celebrated at Festival.’ https://www.tcd.ie/news_events/articles/golden-age-of-irish-crime-fiction-celebrated-at-festival/4465 (accessed 27 November 2013). ‘Irish Crime Fiction: A Festival.’ Trinity College Dublin, 22–23 November 2013. http://irishcrimefiction.blogspot.ie (accessed 21 November 2013). Wallace, Arminta. ‘Killer instinct: a golden age of Irish crime fiction.’ Irish Times, 21 November 2013. http://www.irishtimes.com/culture/killer-instinct-a-golden-age-of-irish-crime-fiction-1.1601482 (accessed 25 March 2014).